The African Queen usually pops to mind when the names Humphrey Bogart, Katharine Hepburn, and John Huston are rolled into one sentence. The pivotal prop from the beloved 1951 movie, this was a real life boat that was listed on the US National Register of Historic Places on February 18, 1992. 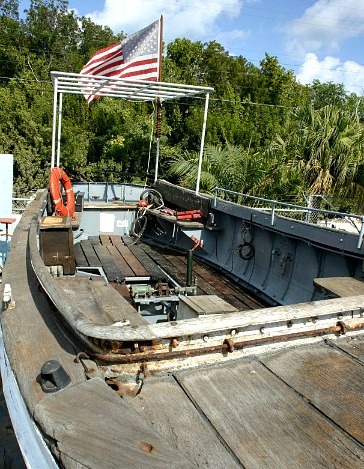 Most people don't realize that this 30 foot Key Largo boat had quite a history before and after the movie. Built in England in 1912, she was constructed out of sheet metal and christened the S/L Livingstone. In the 1800's and early 1900's the British were still very involved in affairs throughout the dark continent. They brought the S/L Livingstone to Africa as a transport vessel designed to carry goods and passengers up and down the Victoria Nile and across Lake Albert. Then came John Huston and the year 1951. 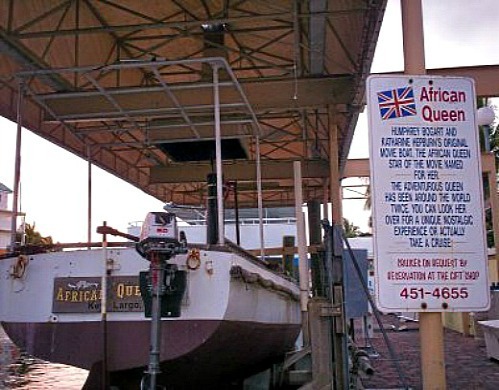 Stationed in the appropriate geographical area, the boat also provided a good physical match of the mental image Huston envisioned for the African Queen movie. The end result, was a brief cinematography moment where this boat left real life, and entered the fictitious and entertaining world of Hollywood. The film's theme revolved around two central characters, Charlie Allnut played by Humphrey Bogart, and Rose Sayer, played by Katharine Hepburn. Charlie Allnut was an often drunk, surly river boat captain who brought mail and supplies to colonists up and down the Nile. Rose was the sister of missionary Reverend Samuel Sayer and they lived on a farm separated from the other colonists in German East Africa. Set in 1914, when WWI first broke out, the people in the colonies were forced to unite and protect themselves from the Germans. Early in the movie, Reverend Sayer dies, and with appropriate cinema timing, Charlie Allnut passes by on his boat and helps the grieving sister bury her brother. Concerned for her safety, Allnut then takes Rose with him on his boat. Worried about her country, and against all odds, strong willed Rose decides that she and Allnut should devise a plan to torpedo the German warship Luisa. This film making era is known for its' grand cinematography, and so the trials and tribulations these two characters are forced to endure are of epic proportions. Not only does the film have the sufficient number of quarrels and squabbles to create the appropriate amount of sexual tension, it has the eventual and overwhelmingly romantic ending. Of course the acting is brilliant, and the S/L Livingstone is made famous. If you're truly nostalgic, or know someone who is, these poster memorabilia and movies available through Amazon make great gifts or collectibles. When the filming ended, the S/L Livingstone was returned to service with the British East Africa Railway. Until 1968 she continued transporting cargo and passengers up and down the Nile and across Lake Albert. In the 1970's the movie prop was discovered in Cairo, Egypt and brought to the United States. Then in 1982, Jim Hendricks Sr. found her sitting idle in Ocala, Florida after a scheme to provide year round cruises failed. Bringing her to Key Largo Florida, Mr. Hendricks kept her docked at an ocean access canal near the Holiday Inn. It was from here that she spent the next several decades providing scenic cruises of the area. However, in 2001 her engine failed, and the Hendricks family decided not to repair her. Sitting idle again, she remained a somewhat interesting but deteriorating attraction. 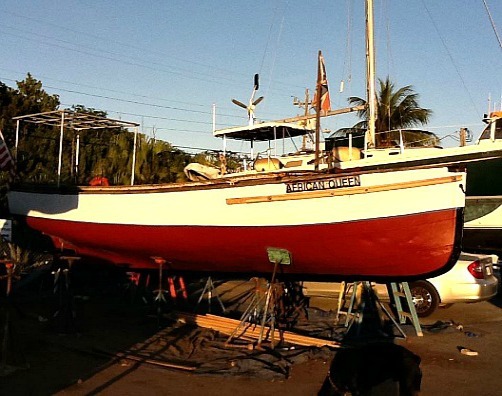 However, in 2011, Captain Lance and Suzanne Holmquist brokered an arrangement with the boat's owner. When I spoke with Suzanne, she explained that after considerable time and investment, she and her husband had returned this Key Largo boat to her former film career glory. Restored to appear as she did in the movie, this once ailing boat is again the beauty she was when she proudly carried Bogart and Hepburn. After being refurbished, on her relaunch debut, Stephen Bogart, son of Humphrey Bogart and Lauren Bacall was on board. This tying in of her famous past to her bright new future, is truly fitting. Today, you can relive those moments as this beautiful Key Largo boat provides daily 1.5 hour canal cruises of the area. At a speed of about 5 - 6 knots, the ship travels the Key Largo canals out to the open ocean, and then returns. Cruises depart at 10:00 am, 12:00 pm, 2:00 pm, 4:00 pm, and 6:00 pm. Friday and Saturday evenings dinner cruises are offered with departures at 6:00 pm. Scheduled for 2 hours and 15 minutes, this Key Largo boat takes it's passengers on a 30 minute trip through the canals to the Pilot House Marina. Before departure, passengers pre-order their meal and upon arrival their salad or soup is waiting, with dinner arriving shortly. After dinner, the boat makes it's 30 minute return trip. All boat tours are out of the Holiday Inn Key Largo, 99701 Overseas Highway (US Hwy 1), at MM 110, Oceanside. For reservations you can call 305-451-8080 or visit www.calypsosailing.com for additional information. Humphrey Bogart and Katharine Hepburn would be proud of their African Queen today. Don't miss out on a chance to reconnect with history, romance and some Hollywood nostalgia on your Key Largo vacation.